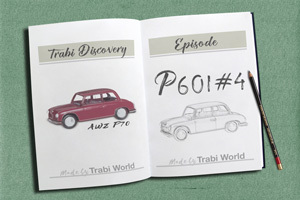 In our series "Trabi Discovery" we collect and preserve sensational, nostalgic and interesting facts about the cult car Trabant. It was to take more than 4 years before the council of ministers decision from 1954, called P50 (P-passenger car, 50= 500 cubic centimeter) appeared. 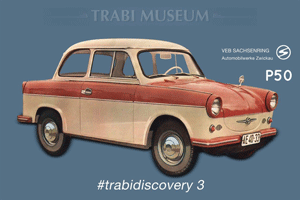 From November 1957 (pilot series) until April 1991 a total of 3.096.099 vehicles (Trabant model range P50, P60, P601, & P1.1) were produced. 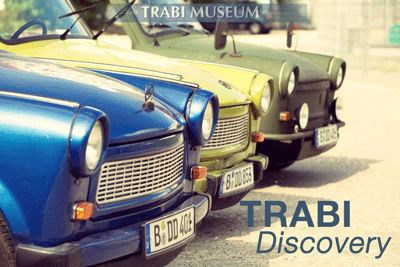 The most famous and the longest manufactured was the Trabant P601 that rolled off the assembly line at VEB Sachsenring, Zwickau, GDR, between June 1964 and July 25th 1990 with a total production of 2.818.547 vehicles. After a short time the entrusted engineers noticed, that the terms of reference on the orders of the cabinet were only achievable by the use of an interim type of the „P50“. A really limited basic industry in the GDR (isolated from the characteristic German steel regions, e.g. the Ruhr region) plus the absence of deep-drawing sheets for the car body manufacture, which came within a trade embargo of the western countries against the GDR, hampered to a special degree the conditions for a (postwar-) relaunch of the automobile manufacture in the GDR. From the start a plastic car body has been chosen for the compact car P50 as a replacement for the body sheets. In 1954, at the time of the birth of the idea to build a compact car with a plastic car body, neither a vehicle design nor production facilities were available. Therefore the „IFA F8“ (an advancement of the nearly structurally identical „DKW F8“), which was built during 1949-1955 - and since 1951 provided with the new plastic - became prototype. It was possible to achieve that changeover that fast because of the IFA F8´s timber scaffolding. Thus the necessary production means could be manufactured in the former Audi-factory Zwickau (then: Automobilwerk Zwickau (AWZ)) themselves. And so that interim type was given the name “AWZ P70 Zwickau” respectively “Sachsenring P 70” from 1958. The P70 became provided mostly with modified technology of the IFA F8. The body-in-white consisted mainly out of timber; the body panels were produced only out of “Duroplast”.